Apples: New Years in the city was an immersive night of dance, music and installations with 14 musical artists and 12 visual artists. An interactive experience in sight, sound and texture, seamlessly woven together and encompassed with an element of surprise. For this event I created two audio installations of expanded sound design. Through the use of sound and music in motion across multiple speakers I can create an emotive experience and a stimulating environment. The first speaker set was a linear quad speaker set over a 50' hallway, with speakers every 10-12'. The patrons entered from the outside into the hallway and were to walk the entirety of the hallway in order to attend the event. The sounds of both score and sound design would move down the hallway with and against the listener. The second installation was an immersive 12.1 system over a 50'/30' space. Six speakers were suspended evenly across the space, 15' above the listener. Another six speakers were distributed at each corner and halfway on the long walls. The sub was placed in the middle of the front short wall. Moving and static sound and score surrounded and engaged the listener. Sounds of birds, cars, trees rustling, people walking by and planes overhead were all utilizes and manipulated across the space. This sound and score was accentuated by projection and set design the patron walked through. 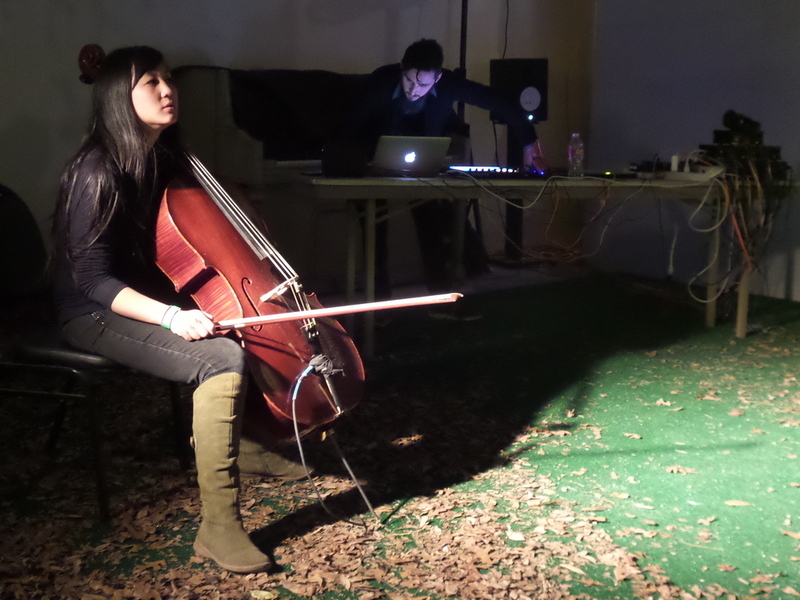 A performance took place as well, electro-acoustic improvisations for electronics and cello (Henna Chou). The improvisations utilized the individual control of each speaker and the ability to send a sound, created by the musicians, moving around the space on its own.